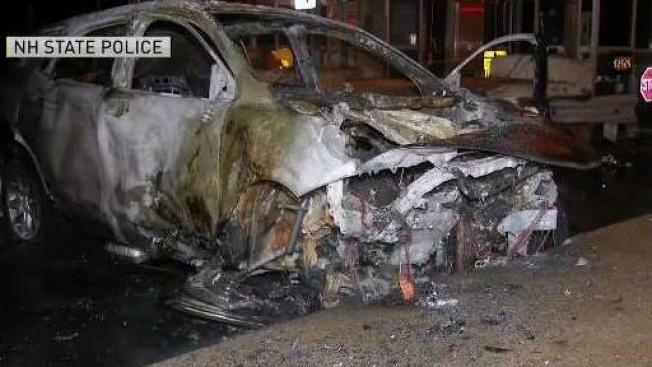 A 39-year-old man was killed following a fiery crash overnight in New Hampshire, according to state police. Shortly after 2 a.m., Justyn Tyndaal of Rochester, New Hampshire, was traveling northbound on the Spaulding Turnpike/Route 16 in Dover when he lost control of his vehicle. Tyndaal struck a concrete barrier when he tried to travel through an EZ Pass lane at the Dover toll plaza, officials said. His vehicle stopped at the toll plaza when it became engulfed in flames. First responders extricated Tyndaal from the car and rushed him to Portsmouth Regional Hospital, where he died. Three northbound lanes at the toll plaza were shut down for about two hours while state troopers investigated the scene. The crash remains under investigation. Anyone with information on the fatal crash is encouraged to contact Trooper Eric Call at 603-223-8490 or eric.call@dos.nh.gov.